Celebrate Fidel Castro’s 90th birthday by reading some Castro | Fight Back! 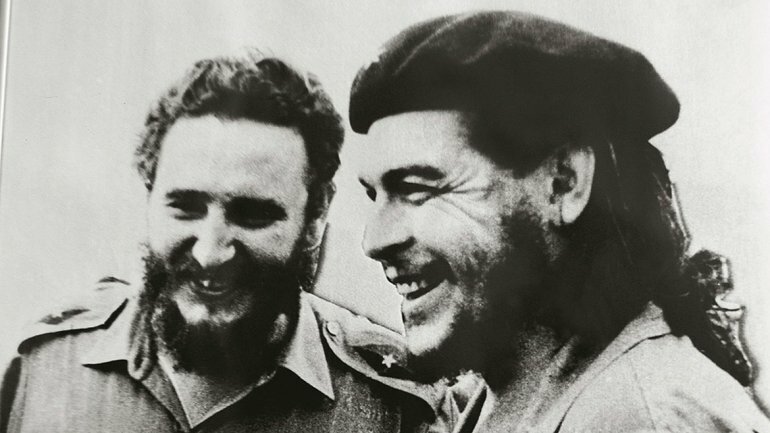 Fidel Castro with Che Guevara. In honor of Fidel Castro’s 90th birthday, Fight Back! is circulating a speech he delivered on May 1, 2003. Castro was born on August 13, 1926. Enjoy. Some may have believed that the rise of the empire to the status of the sole superpower, with a military and technological might with no balancing pole anywhere in the world, would frighten or dishearten the Cuban people. Yet, today they have no choice but to watch in amazement the enhanced courage of this valiant people. On a day like today, this glorious international workers’ day, which commemorates the death of the five martyrs of Chicago, I declare, on behalf of the one million Cubans gathered here, that we will face up to any threats, we will not yield to any pressures, and that we are prepared to defend our homeland and our Revolution with ideas and with weapons to our last drop of blood. What is Cuba’s sin? What honest person has any reason to attack her? All of the country’s land was recovered and turned over to the peasants and agricultural workers. The natural resources, industries and basic services were placed in the hands of their only true owner: the Cuban nation. It has brought free education to 100% of the country’s children. It has the highest school retention rate –over 99% between kindergarten and ninth grade– of all of the nations in the hemisphere. Computer education and the use of audiovisual methods now extend to all of the country’s children, adolescents and youth, in both the cities and the countryside. There are schools for the training of artists and art instructors throughout all of the country’s provinces, where over 20,000 young people are currently studying and developing their talent and vocation. Tens of thousands more are doing the same at vocational schools, and many of these then go on to undertake professional studies. University campuses are progressively spreading to all of the country’s municipalities. Never in any other part of the world has such a colossal educational and cultural revolution taken place as this that will turn Cuba, by far, into the country with the highest degree of knowledge and culture in the world, faithful to Martí’s profound conviction that "no freedom is possible without culture." Today, in our country, people die of the same causes as in the most highly developed countries: cardiovascular diseases, cancer, accidents, and others, but with a much lower incidence. Social security covers 100% of the country’s citizens. Discrimination against women was eradicated, and today women make up 64% of the country’s technical and scientific workforce. From the earliest months of the Revolution, not a single one of the forms of racial discrimination copied from the south of the United States was left intact. In recent years, the Revolution has been particularly striving to eliminate any lingering traces of the poverty and lack of access to education that afflicted the descendants of those who were enslaved for centuries, creating objective differences that tended to be perpetuated. Soon, not even a shadow of the consequences of that terrible injustice will remain. In our country there are no paramilitary forces or death squads, nor has violence ever been used against the people. There are no executions without due process and no torture. The people have always massively supported the activities of the Revolution. This rally today is proof of that. The same was true during the ten years that Cuba supported Agostinho Neto’s MPLA in the struggle for the independence of Angola. After independence was achieved, and over the course of 15 years, hundreds of thousands of Cuban volunteers participated in defending Angola from the attacks of racist South African troops that in complicity with the United States, and using dirty war tactics, planted millions of mines, wiped out entire villages, and murdered more than half a million Angolan men, women and children. Without the Cuban doctors offered to the United Nations in the event that the necessary funds are obtained –without which entire nations and even whole regions of sub-Saharan Africa face the risk of perishing– the crucial programs urgently needed to fight AIDS would be impossible to carry out. Cuba has developed techniques to teach reading and writing by radio, with accompanying texts now available in five languages –Haitian Creole, Portuguese, French, English and Spanish– that are already being used in numerous countries. It is nearing completion of a similar program in Spanish, of exceptionally high quality, to teach literacy by television. These are programs that were developed in Cuba and are genuinely Cuban. We are not interested in patents and exclusive copyrights. We are willing to offer them to all of the countries of the Third World, where most of the world’s illiterates are concentrated, without charging a penny. In five years, the 800 million illiterate people in the world could be reduced by 80%, at a minimal cost. After the demise of the USSR and the socialist bloc, nobody would have bet a dime on the survival of the Cuban Revolution. The United States tightened the blockade. The Torricelli and Helms-Burton Acts were adopted, both extraterritorial in nature. We abruptly lost our main markets and supplies sources. The population’s average calorie and protein consumption was reduced by almost half. But our country withstood the pressures and even advanced considerably in the social field. Cuba was the first country to extend its solidarity to the people of the United States on September 11, 2001. It was also the first to warn of the neo-fascist nature of the policy that the extreme right in the United States, which fraudulently came to power in November of 2000, was planning to impose on the rest of the world. This policy did not emerge as a response to the atrocious terrorist attack perpetrated against the people of the United States by members of a fanatical organization that had served other U.S. administrations in the past. It was coldly and carefully conceived and developed, which explains the country’s military build-up and enormous spending on weapons at a time when the Cold War was already over, and long before September 11, 2001. The fateful events of that day served as an ideal pretext for the implementation of such policy. "…the great achievement of our time, and the great hope of every time --now depends on us." "The course of this conflict is not known, yet its outcome is certain … and we know that God is not neutral." "We must uncover terror cells in 60 or more countries…"
"…we will send you, our soldiers, where you're needed." "Some worry that it is somehow undiplomatic or impolite to speak the language of right and wrong. I disagree. … We are in a conflict between good and evil, and America will call evil by its name. By confronting evil and lawless regimes, we do not create a problem, we reveal a problem. And we will lead the world in opposing it." "As you can see, he doesn’t mention once in his speech (at West Point) the United Nations Organization. Nor is there a phrase about every people’s right to safety and peace, or about the need for a world ruled by principles and norms." "Hardly two thirds of a century has passed since humanity went through the bitter experience of Nazism. Fear was Hitler’s inseparable ally against his adversaries… Later, his fearful military force [led to] the outbreak of a war that would inflame the whole world. The lack of vision and the cowardice of the statesmen in the strongest European powers of the time opened the way to a great tragedy. "I don’t think that a fascist regime can be established in the United States. Serious mistakes have been made and injustices committed in the framework of its political system --many of them still persist-- but the American people still have a number of institutions and traditions, as well as educational, cultural and ethical values that would hardly allow that to happen. The risk exists in the international arena. The power and prerogatives of that country’s president are so extensive, and the economic, technological and military power network in that nation is so pervasive that due to circumstances that fully escape the will of the American people, the world is coming under the rule of Nazi concepts and methods." "The miserable insects that live in 60 or more countries of the world chosen by him and his closest assistants --and in the case of Cuba by his Miami friends-- are completely irrelevant. They are the ‘dark corners of the world’ that may become the targets of their unannounced and ‘preemptive’ attacks. Not only is Cuba one of those countries, but it has also been included among those that sponsor terror." Today the so-called "dissidents", actually mercenaries on the payroll of the Bush’s Hitler-like government, are betraying not only their homeland, but all of humanity as well. We fully respect the opinions of those who oppose capital punishment for religious, philosophical and humanitarian reasons. We Cuban revolutionaries also abhor capital punishment, for much more profound reasons than those addressed by the social sciences with regard to crime, currently under study in our country. The day will come when we can accede to the wishes, so nobly expressed here in his brilliant speech by our beloved brother Reverend Lucius Walker, to abolish such penalty. The special concern over this issue is easily understood when you know that the majority of the people executed in the United States are African American and Hispanic, and not infrequently they are innocent, especially in Texas, the champion of death penalties, where President Bush was formerly the governor, and not a single life has ever been pardoned. We cannot ever hesitate when it is a question of protecting the lives of the sons and daughters of a people determined to fight until the end, arresting the mercenaries who serve the aggressors and applying the most severe sanctions, no matter how unpleasant it is for us, against terrorists who hijack passenger boats or planes or commit similarly serious acts, who will be punished by the courts in accordance with the laws in force. The policy of the U.S. government is so brazenly provocative that on April 25, Mr. Kevin Whitaker, chief of the Cuban Bureau at the State Department, informed the head of our Interests Section in Washington that the National Security Council’s Department of Homeland Security considered the continued hijackings from Cuba a serious threat to the national security of the United States, and requested that the Cuban government adopt all of the necessary measures to prevent such acts. A shameless scoundrel with the poorly chosen first name Lincoln, and the last name Díaz-Balart, an intimate friend and advisor of President Bush, has made this enigmatic statement to a Miami TV station: "I can’t go into details, but we’re trying to break this vicious cycle." If the solution were to attack Cuba like Iraq, I would suffer greatly because of the cost in lives and the enormous destruction it would bring on Cuba. But, it might turn out to be the last of this Administration’s fascist attacks, because the struggle would last a very long time.